I wanted to show you a sneaky peak of something we’ve been working on this week for a client that is so unbelievably cute, warming and lovely that we shot it during the day & at night to capture its glow. New to the website are these pretty bird cages which are perfect for wedding receptions as a safe place for guests to post wedding cards / little gifts and the like instead of a wedding card box. Wedding bird cages are going to be huge for 2010 and are set to stay for 2011/2012 weddings as the hottest accessory for wedding receptions. They are perfect to buy as a single item to put on a table at the evening reception or a table at the entrance to the wedding breakfast or even as table centre pieces for wedding tables (especially when filled with fairy lights as our Enchanted Option to add twinkles to wedding tables). 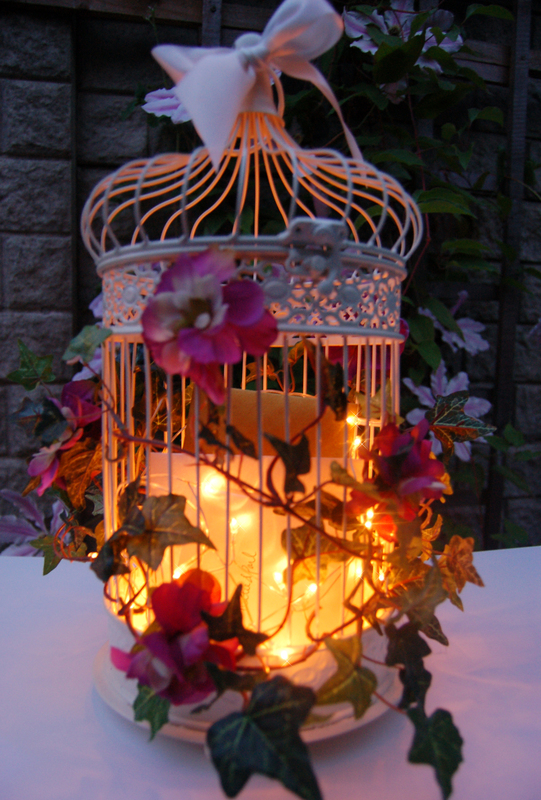 There are 5 bird cages to choose from in different styles including plain bird cage; trailing ivy bird cage; rose garden bird cage – have any coloured flower to suit your wedding colours; butterfly bird cage & enchanted fairy lights bird cage (more images follow). 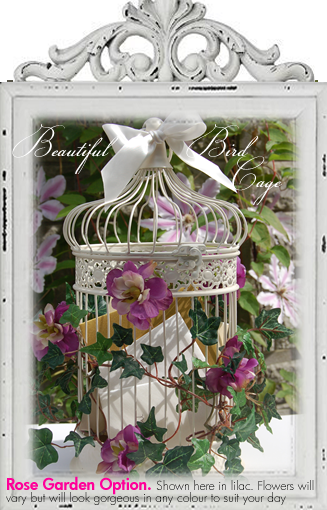 The website is currently being updated with all available images of the styled bird cages. Until then, they can still be ordered from the website but not all images are available yet. We will post them as soon as the page is ready. Where are you based? We sell these centre pieces in any colour/style but we are based in the UK. We’ve sold out until mid August 2010 but are taking pre-orders from the website. I Loved your birdcages. Are the flowers and ivy real? If so, do they wilt during the evening?